Verifying digital file signatures can make your pc's disinfection job a lot easier. It can also prevent you from deleting important system files. When this message is displayed, you can click No button, and the file won't be deleted. 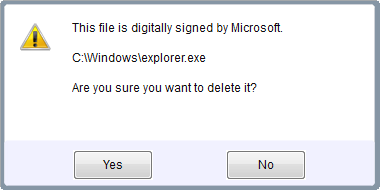 However, if you're sure you want to delete the file, then you can click Yes and it will be deleted, but we won't be responsible if you delete important system files. Remember that the files are moved to the recycle bin. While you don't empty it, you'll be able to restore the deleted files from there in case you make a mistake. When you verify a file signature using UVK, it will tell you if the file is digitally signed or not, and the publisher's name. When a file is digitally signed, it will display Signed. If not it will display Unsigned. It can also display Bad signature or Unable to verify or Untrusted root, in some special cases. If the publisher's name is available, it will display his name. If not, it will display n/a (Not available). Unsigned : n/a ; Unsigned : ATI Technologies Inc. ; No signature ==> The file is not digitally signed. Untrusted : Microsoft Corp ==> Beware of these files. They are signed but the signature is not trusted. Signed : Microsoft Corporation ; Signed : Acer Incorporated ==> The file is digitally signed and trusted. Important: Not all unsigned files are bad, and viruses files can be digitally signed, though it is very rare. If you have many running files which you don't know what they do, nor the publisher, try creating an UVK log and analyze it with the Log analyzer. Then you'll dispose of the right tools to get more information about those files.